The MINI Roadster is the sixth derivative in the current MINI line-up, joining the Hatch, Convertible, Clubman, Countryman and Coupé in MINI's modest but successful portfolio of motors. The Roadster comes complete with MINI Connected, the brand's app-based multimedia system, which gives you access to both your Facebook and Twitter updates via an on-board monitor that's conveniently placed at the centre of the MINI's trademark central circular speedo. There's also a built-in sat nav system on board – a welcome feature is the ability to export addresses previously searched for on Google Maps to the on-board navigation system - DAB radio and you can even access RSS feeds to keep yourself up to date with the latest goings-on. Also in the mix is Bluetooth telephone audio connection. Simply pair it to your smartphone and you can make and receive calls without taking your hands off the wheel and your eyes off the road – an essential fixture in today's mobile mad society. Our only criticism is the dial used to control the car's multimedia system. MINI Connected is controlled via a small dialler above the handbrake, which can get a bit fiddly as you scroll through the alphabet to enter a postcode in the sat nav system. We would have much preferred a touchscreen monitor that's less tricky to use, especially while driving. You can reap the full benefits of summer thanks to the Roadster's retractable roof which, disappointingly, has to be locked and unlocked manually. It's a flaw in the makeup of the motor that, we feel, hinders its potential as being considered a tech-friendly road robot. However, it does comes down with the press of a switch - even when the car is moving (up to 20mph) - and there's a spoiler on the rear which pops up automatically when the car picks up speed – a nifty feature that enhances the drive we're told. 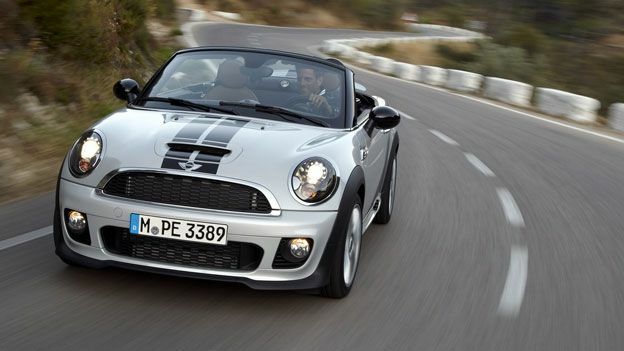 The MINI Cooper SD (disel) Roadster has two seats, a retractable roof, a top speed of 132mph and goes from 0-62mph in 8.1 seconds. The 2.0-litre turbo unit delivers ultimate power. Take off is quick and effortless and the car is stiff so you needn't worry about it being bullied off the road. We loved the automatic start/stop function – the Roadster automatically hibernates the engine when the car is in neutral and turns it back on when you step on the clutch – and steering is both sharp and accurate. However, rear visibility is pretty awful – fortunately the Roadster comes equipped with Park Distance Controller (PDC) at the rear which displays the distance between the car and the objects behind it – and it did feel a bit bumpy at times, especially while shooting down the motorway. It's solid and stylish, comes loaded with essential road trip kit and with a spacious boot to, err, boot, it's the ideal weekend getaway motor. The tech may be a bit fiddly to control but overall there's enough gadgetry to satisfy the tech heads and plenty of stylish features to keep the fashionistas happy. On the performance front, you won't be disappointed (unless you're a sucker for slow speeds) and there are a string of quality finishing touches like the brand's trademark toggle switches that polish this four-wheeler off nicely – an all-round visually pleasing effort as far as we're concerned.